Casita Coco is one part of the uniquely configured private home called the CocoBayou Cottage and it is the perfect escape for you and your family and friends. This property can be rented separately or combined to accommodate a large party! This side of the gorgeous home sleeps 4. The property has recently been updated with new furnishings and completely renovated inside and out. Enjoy a spacious floor plan that includes 1 king bed and a sofa sleeper that can accommodate up to 4 guests. Additionally there is a fully equipped kitchen, washer/dryer, and a patio If you want to stay connected there are two (2) flat screen TVs, cable television, free Wi-Fi, and a telephone. 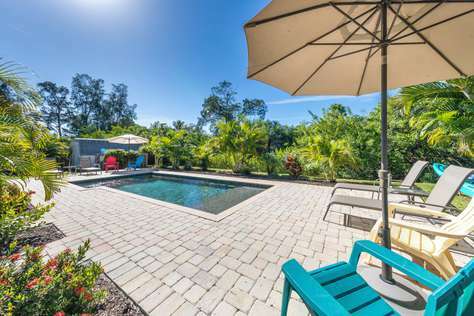 Enjoy the heated pool in the winter and a great backyard with plenty of space to sunbathe or grill out. Guests can take a short walk down the street to the intarcostal shore and drop in a fishing line. Kayaks and bicycles are also available at the property as well! If you have a larger party [up to 10] and would like to book the entire cottage [CocoBayou Cottage], simply reserve CoCoBayou Cottage on our website or by calling a vacation specialist directly. It will be treated as two separate reservations for the same property. If you have any questions, just contact our team for help! help!